26-Oct-2001 -- (This story continues on from our account of confluence 22º north, 111º east). We were on a high! We had attained our first two confluences, and both on the same day. Could we achieve a third? Not likely, as it was already late afternoon, but at least we could get as close as possible. We took a bus from Changpo back to Gaozhou, where we rejoined route 207, heading north again on another bus that took us as far as Xinyi. This was as far as we were able to get that night, there being no more busses heading north from Xinyi at that hour. This was quite surprising, as it was only 6:30 p.m., but the operators were adamant that no busses were available. (We were going to find out why the next morning.) It was a shame, because the distance to the next confluence was only 70 kilometres. We checked into the Taichang Hotel for 138 yuan (US$17) a night, then hit the town to enjoy dinner at an outdoor night market, which came to a staggering total of 3.5 yuan (US$0.43) for the two of us, followed by a visit to a local hairdresser for a 90-minute full-body massage, hair wash and blow dry, all for 45 yuan (US$5) each. The girl who gave Targ his massage did something funny to his funny bone, and his left arm remained painful for days afterwards. But still, when we finally got back to our hotel late that night, we were feeling clean and relaxed, as well as thoroughly exhausted, and sleep came easily. We got up early, checked out of our hotel, crossed the street to the bus station, and found the bus to our next destination, Cenxi, which was due to depart at 7:10 a.m. This left us just sufficient time to enjoy breakfast in a restaurant adjoining the bus station. Although it was a daytime journey, for some reason this was a sleeper bus; neither of us had ever ridden in a sleeper bus before. We selected good berths at the front of the bus, the bus conductor allowing Tony the luxury of a double berth all to himself. Even so, the 1.7-metre berth was grossly inadequate for Tony's 2-metre height, and his legs extended forward next to the driver, almost touching the gear-stick. The first part of our journey to the border between Guangdong Province and the Guangxi Autonomous Region was uneventful, with paved roads all the way, and we were able to grab some more sleep. 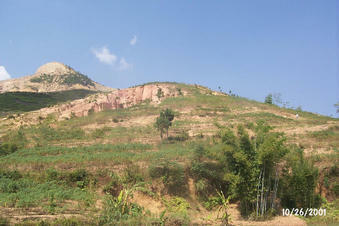 When we crossed into Guangxi however, route 207 deteriorated into a dirt road, and progress was much slower. We had a brief comfort stop at a town called Shuiwen. Here Targ found some specimens of a plant in which he is particularly interested, called the crown of thorns, and broke off a small twig from one of them, planning to re-pot it and add it to his collection when he got back home to Hong Kong. Our bus proceeded north to the end of route 207, then turned east on route 324, a busy paved highway, which took us all the way to Cenxi, where we arrived at 11:10 a.m., exactly four hours after leaving Xinyi. The GPS put us about 8 kilometres south of the confluence, but we didn't have very good maps of this area, so were uncertain how easy it was going to be to locate it. Then Tony made a fantastic discovery; on the wall of the bus station was a tremendously detailed map of the region surrounding Cenxi, which told us everything we needed to know. We walked out of the bus station and found several small, yellow taxis waiting outside. We headed towards one of them, then saw another one with a woman driver, and elected to get in that one instead. It's worth pointing out that, at this stage, she was driving a gleaming, spotless car in absolutely pristine condition. We directed her north on the main road, then down a side road off to the west. This road was nothing but a dirt track, absolutely destroyed by a constant stream of heavy trucks carrying gigantic boulders from a nearby quarry, and totally unsuitable for our little taxi. Our driver was, by her own admission, quite inexperienced -- she'd been driving for only three months -- and probably because of this did not have the confidence to object to what these two foreigners were subjecting her and her little car to by venturing down this track. We followed the track for several kilometres, eventually passing the turnoff to the quarry, which meant we no longer had to dodge the giant trucks. We continued for a while more, past another fork, until our GPS told us that we had chosen the wrong way. Turning the car around on a tiny dirt track proved an almost impossible task for our novice driver, who was not very adept at reversing. Eventually we got the car heading back the way we had come, and took the other track at the fork, which led down to a mostly dried up riverbed. Our driver was really getting nervous by this stage, especially after the car got high-centred and we had to get out and push. After we got out of the taxi at our destination, Tony, who had been sweltering in the back seat where the tiny car's air conditioning simply did not reach, decided to change out of his long pants into a pair of shorts. Having done so, he promptly slipped and fell on the gravel path, badly grazing his right leg. Undeterred, we made our way along the riverbed in the direction of the confluence, which was about 350 metres away from where we had left the taxi. Our driver started to come with us, but beat a hasty retreat after only a minute under the hot sun in her all-black outfit. The confluence was on the side of a hill on the opposite side of the riverbed. Finding a place to leave the riverbed and start climbing the hill proved to be somewhat problematic. Tony stepped on what he thought to be solid ground, only to discover that it was quicksand, and immediately lost his sandal two feet below the surface. He struggled to rescue it, but it was broken beyond repair, and he managed to destroy his other sandal in the process! Having brought only two sets of footwear with him on this journey, and the first set, a pair of hiking boots, having already been sacrificed to the conquest of our first confluence at 21º north, 110º east, Tony was now without any footwear at all, and climbing the hill to the confluence 160 metres away was out of the question. So Targ carried on alone, making his way up the terraces on which a type of Chinese medicinal plant was being cultivated. The confluence was reached at 12:30 p.m. Targ took the required photos, then headed back down to the riverbed where Tony was forlornly waiting. When we arrived back at our taxi, which was parked outside a small shop where a group of locals had gathered, one old lady in the group found Tony's bloodstained right leg to be the source of great amusement, and laughed hysterically. We got back in the cab, only to discover it was like a furnace, so quickly got out again, and instructed the driver to run the air conditioning for a while. Once it was cool enough to re-enter, we got back in, then got back out again as she went through the tortuous process of reversing in order to turn the car around, and then to navigate the large bump in the track where she had become high-centred before. We asked her to take us to the best hotel back in Cenxi, so that Tony could "have a dump," clean his wounds, and we could have some lunch. We invited her to have lunch with us, but she spotted a car wash in the hotel compound, and declined our offer in favour of restoring some sense of dignity to her badly battered vehicle. By now, it was totally covered in dust, patches of paint-work were missing, and the speedometer no longer worked. We felt a bit guilty, and gave her 100 yuan (US$12) for what was a 70 yuan (US$9) trip on the meter. We lunched at the hotel, and Targ decided to also avail himself of the clean squat toilet to "have a dump." These were our first bowel movements since leaving Hong Kong, and we had visited three confluences in the interim, so we felt that they were well worth recording here. (This story continues with our next confluence attempt at 23º north, 112º east).